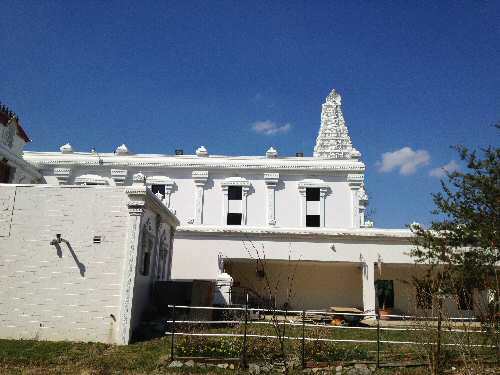 For anyone interested in ‘Kovil Thirupani’ (temple deeds & renovation), a visit to the Sri Siva Vishnu Temple in Lanham, MD is a great opportunity. Looks like the temple is working on procuring “Mooshika Vahana” (Mouse vehicle for Lord Ganesh) for ‘Vahana Seva’ at $15,000 for use in the temple festivals. 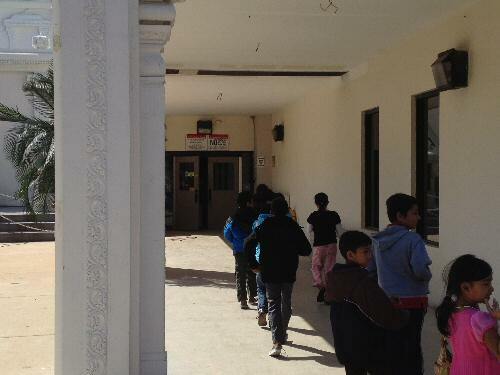 Devotees are requested to contribute – tax exempt! 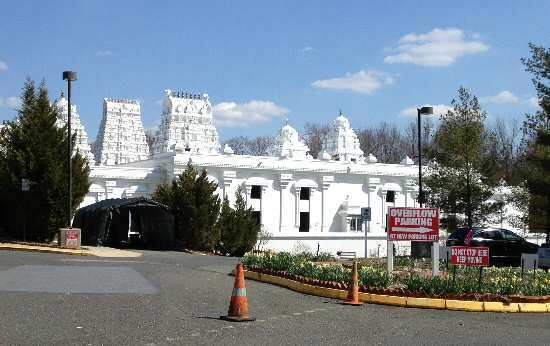 When I entered Cipriano Road, Lanham (MD), my eye was zooming here and there for the temple until I realized, I had 1.5 miles yet to cross. The serene road itself hinted to me of the Supreme Being’s presence. I fumbled here and there but no one honked behind me.That made me even more comfy and settled my nerves. After doing a few rounds to get a parking spot, as it was full (Easter weekend and ‘Panguni Uthram’), I found one exactly in front of the temple. It all started with the shrine of Lord Karthikeya as I walked in the main door, followed by the shrines of Lord Siva as Ramanatha Swami, left of him, glancing east, was a shrine for Durga Devi, a few yards behind her, parallel to Siva sits Swami Ayyappa. 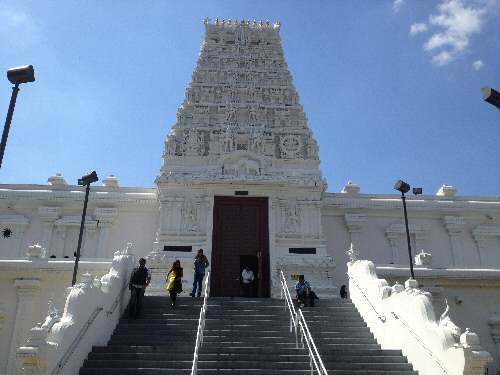 Besides there were shrines of Lord Ganesha, Saraswathi, Parvathi, Lakshmi, Krishna and Andal. Krishna without the flute stumped me and it didn’t take long for the striking Udupi deity to get into my mind. And then the great Balaji! Shrines of Hanuman and Rama were close together. The shrine of Maha Vishnu in his reclining posture reminded me of Sri Ranganatha Swami that made me too nostalgic. That reminded me that my mission wasn’t accomplished yet. Beware! “No Smoking. No Alcohol. No Non-veg”. 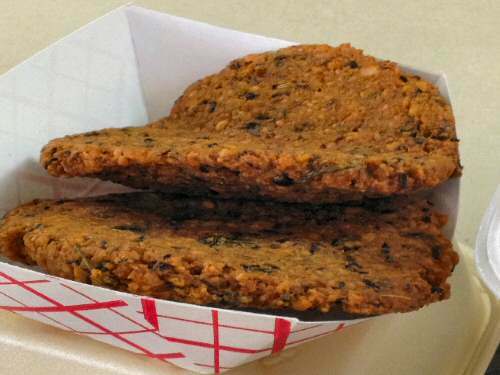 After waiting through a long line when my turn hit, my sight went straight on what looked like ‘Maddur Vada’ and I started drooling instantly. But it turned out to be only ‘Masala Vada’ and not the best taste. I suspect the caterers were resolutely orthodox so they even refrained from onion and garlic. 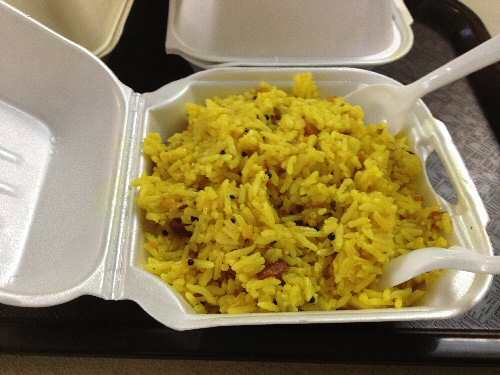 As my expectations nosedived, I reluctantly opened the lemon rice box. A sudden twist in the taste and I was pleasantly surprised. The rice was not too thick and mushy. Not only did the texture feel good but the taste was also good. Spice was at its right amount. 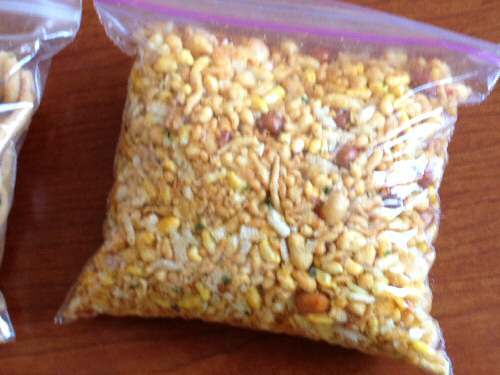 The split lentils and the Bengal gram rocked most bites! 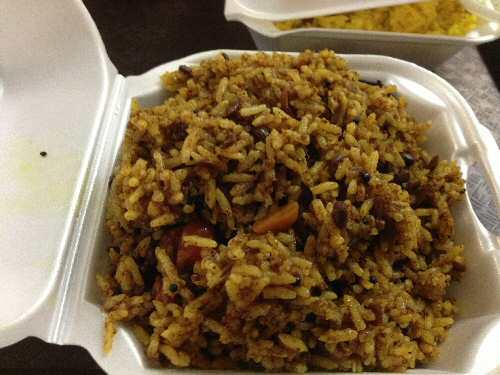 The Tamarind rice was a big disappointment despite its mouth watering texture. 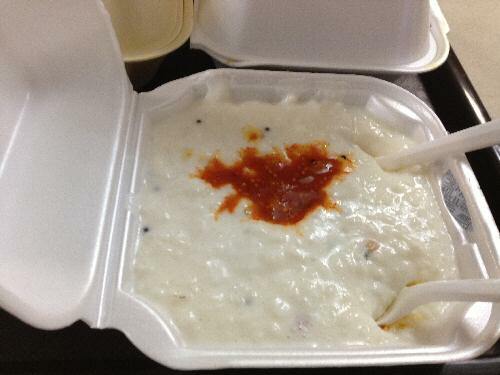 Yogurt rice was little too sharp and sour that I didn’t personally find the best. I bet a lot people crave that kind of sourness. The pickle was good though. 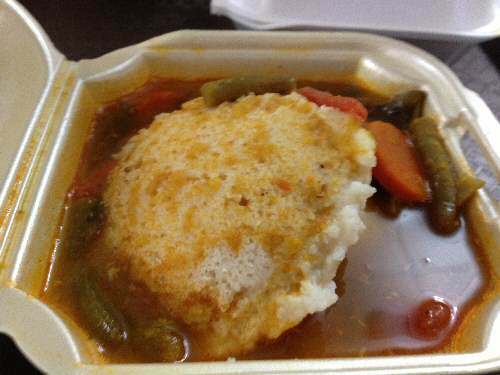 The biggest disappointment of all was the Idly Sambar. It was smothered with asafoetida. It also had green beans which I found a little strange. I wish it had some chutney to go with it. Oh well…it was just a Saturday menu. 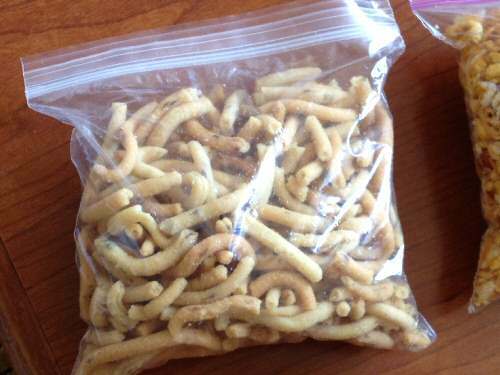 But as an icing on the cake I ended up taking to my suite a full packet of mixture and murukku. The mixture was friggin’ delicious! Crispy, fresh, yummy and spicy enough to satisfy all corners of your taste buds. The Temple also has a play area with swings for both kids and adults. Other than these, after doing three rounds inside the temple, I suddenly noticed a picture that had a priest receiving Obama with a silk shawl in the front hall. The President looked a bit miffed. Rarely do we get the opportunity to see a lot of major deities gathered at one spot. Lanham, MD has it, folks. 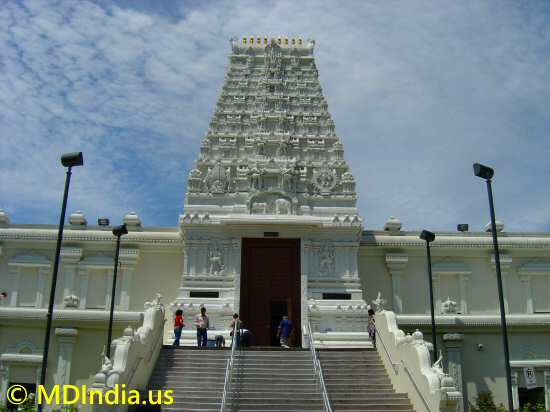 South Indian Temple Canteens in the U.S.
Snacking with Flushing Ganesh – Oh God, Here We Come!